The Mono Hot Springs area prior to the 1920’s was only accessible by horseback using old Indian trails. Some of the first trips to Mono Hot Springs in the early 1890’s were from the foothill community of Auberry just east of Fresno, where a 60 mile trip by Pack horses and mules would take four or five days. There are written accounts of the Mono Indians in these early times taking people by horseback to Mono Hot Springs for health benefits. By 1923 a Pack Station was available at Huntington Lake that opened up the area for more people. Power was badly needed for the growing Los Angeles area since most of the power supplied by steam generator plants was used for electric streetcars. Engineer John Eastwood, had a vision of creating a hydroelectric water project of capturing water from the San Joaquin River Basin Wilderness that many believed to be impossible and far-fetched. After a few years of surveying, Mr. Eastwood devised an unprecedented Hydroelectric Plan of immense engineering proportions, rivaling the Panama Canal project, and the largest hydroelectric project in the world at the time. The “Big Creek Project” plan was a vast system of lakes and connecting tunnels, penstocks and power houses that was put into action by the Southern California Edison Company (SCE) in 1910. 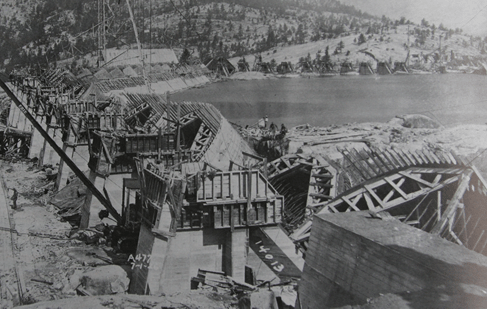 By 1917 the Huntington Lake project was completed with limited power capacity. 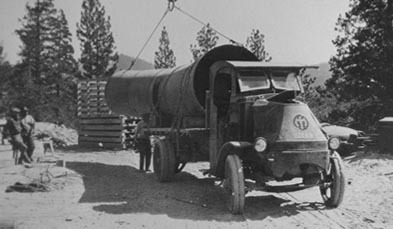 In 1920, expansion was started by building a road over Kaiser Pass from Huntington Lake for the construction of Florence Lake and the 13 mile Ward Tunnel to fill Huntington Lake and Shaver Lake for greatly increased power capacity. 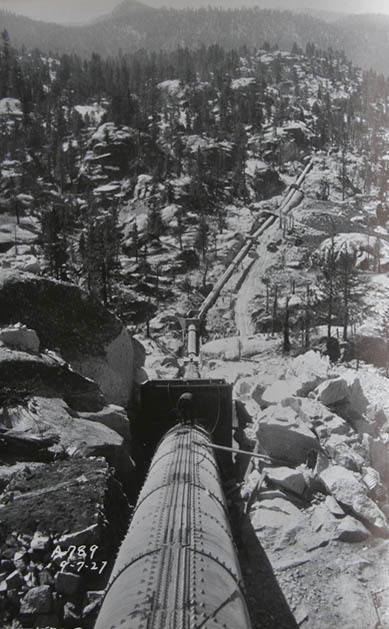 The Ward Tunnel straight through the granite mountain was a huge engineering feat with over 500 men working all year long. 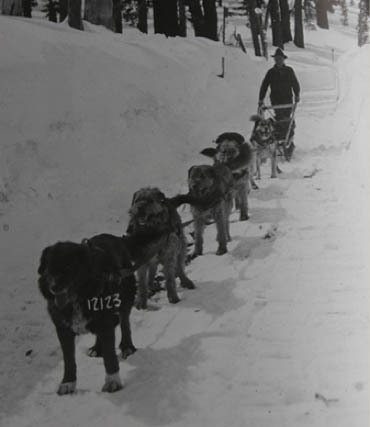 In the winter mail was delivered over 20 miles of snow by Jerry Dwyer’s dog team. The dogs were buried on Kaiser Pass where a sign commemorates the man and his dogs. By 1926 the additional 6 miles of road to Mono Hot Springs and Bear/Mono Creeks for diversion dam construction was completed. In the book ‘The Story of Big Creek’ by Chief Engineer Dave Redinger, says this about that section of the road: “Between six and seven miles of road had to be built through the worst terrain imaginable. Boulders the size of houses, and huge ledges of the hardest granite were encountered. The routes appeared to be almost impossible…it is amazing what men with determination, portable air compressors, jackhammers and powder can accomplish when once started.” It was nicknamed the “Cheap and Nasty”, and opened for the public in 1927. In 1954 Edison Lake was completed, the last of the Big Creek project Lakes in this area. Photos above from the Story of Big Creek by Dave Redinger. Old 1934 CCC built Bathhouse and footbath. The Kaiser Pass Road resulted in increased travel to Mono Hot Springs. The many hot springs, scenic landscapes and recreation opportunities attracted many people from all over California. 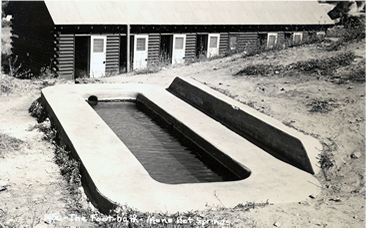 Therefore, the Forest Service decided to utilize the depression era Civilian Conservation Corps (CCC) for the 1934 construction of a Bathhouse and several buildings over concrete walled springs on the south side of the San Joaquin River. On the north side of the river the CCC built a campground. Before World War II the area was very popular with Japanese Americans because the hot springs mineral content was similar to many hot springs in Japan, and many stayed all summer because in those early days there were no camping restrictions. The buildings were torn down in 1963 and a new bathhouse built on the north side of the river. However, the CCC built concrete walled springs are still used by the public. 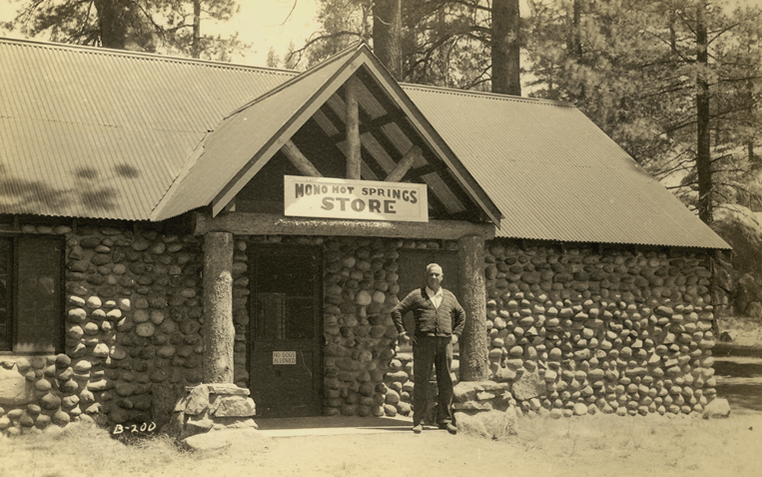 Construction of Mono Hot Springs Resort was started in 1935 by Walter Hill after securing a permit from the Forest Service. He was a general contractor from Sanger that frequently traveled to Mono Hot Springs for fishing, hunting and loved the therapeutic effects of the hot springs. Construction of the resort was a family affair. Since Mr. Hill was almost 60 years old, he made his two daughters and son in laws partners. In 1937, after the general store and several wooden cabins were completed, the resort opened with great fanfare. Construction of the cobblestone cabins started that same year. Collecting the cobblestones in the river was a slow and arduous process, taking all summer to build just one cabin. Walt Hill wanted to build the resort mostly with native cobblestones to harmonize with the natural environment. By 1949 most construction of the resort was finished with 24 cabins, café, and a general store. Mr. Hill was a gentle and great mountain man and even after selling the resort, he still continued to come to Mono Hot Springs to fish and hunt up until his untimely death in 1972 at 94 just after a moose hunt in Alaska. His daughter, Doris, died in October of 2010 on her 100th birthday. Frank Winslow and Sons purchased the resort from Mr. Hill in 1963. The Winslow family had been coming to Mono Hot Springs since 1951 and loved small steam trout fishing. Several upgrades to the interiors of all the cabins have been an ongoing process the last 50 years. A new cobblestone bathhouse was built with a spa and massage. New tent cabins have been built and several other improvements. However, the character of the resort has remained the same and in 2000 the resort was evaluated as eligible for a listing in the National Register of Historic Places. 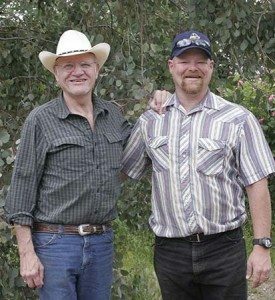 Today Jeff Winslow and son Joe operate the resort and after 50 years of meeting and befriending many wonderful people, the Winslow’s are proud of taking a true interest in making sure all their guests have a great vacation time at Mono Hot Springs.